Twelve newborn babies are dead after a fire erupted at a Baghdad hospital on Wednesday, the Iraq’s Health Ministry said. The ministry also reported 29 women and nine babies were injured in the blaze. The fire broke out in a corridor of the maternity ward of al-Yarmouk hospital, which lies in central Baghdad. Officials said the incident happened shortly after midnight after an oxygen bottle exploded in a corridor, setting off an electrical fire. 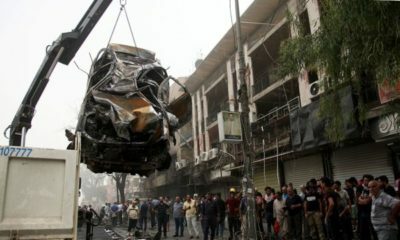 “Civil defence forces managed to extinguish the fire, evacuating the injured to nearby hospitals. Initial findings indicate the incident was caused by an electrical short circuit,” Iraqi Health Ministry spokesman Ahmed al-Rudaini said. Are you Getting Married Between Now and December 2016? The “Play Network Wedding Package” Gives you 20% Discount on the Best Wedding Vendors! Awww, how sad, after all the waiting,preparation, stress and Joy this now happened? May their souls rest in peace and God be with these parents(I really dont know the right word to use a it hurts) 🙁 lossing a child is one of the worst thing to hit a parent. This is just heartbreaking. Such a terrible way to die. So sad! What a heartbreaking news. Such a terrible way to lose young innocent lives! Hmmn!